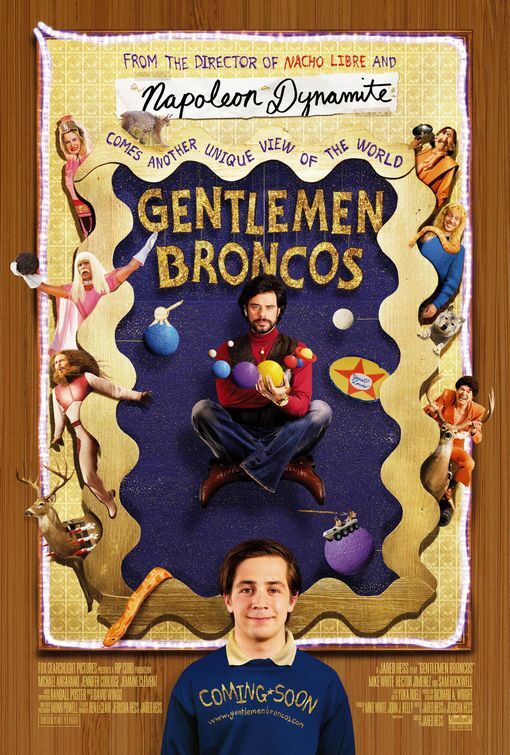 “Gentlemen Broncos” is a quiet but interesting comedy that focuses on a young writer named Benjamin (Michael Angarano), who does double duty as the film’s unlikely hero and as its sole voice of reason. That second part means a lot here, particularly since a great deal of the people Benjamin has to deal with are so eccentric and ridiculous that they seem like visitors from another galaxy, like a friend who shoots strange movies with his camcorder, or another who wears his pet snake on his shoulders. You’d think that’d give Benjamin some ideas for all those science-fiction novellas he likes to write, but considering that his latest is called “Yeast Lords: The Bronco Years,” what he comes up with seems bizarre enough already. Eager to break into the publishing industry, he takes “Yeast Lords” and heads to the Cletus Festival, where a bunch of adolescent writers congregate and sign up for a number of contests and courses. One of the teachers is Dr. Ronald Chevalier (Jemaine Clement), a bombastic sci-fi writer whose career began with a series of books he wrote as a teenager. His worship of Chevalier inspires Benjamin to have him evaluate “Yeast Lords” for a contest, which attracts lots of other quizzical manuscripts that make his work seem credible by comparison. Still, Chevalier thinks “Yeast Lords” is a good story – so good, in fact, that he makes a couple of changes and sends it to his publisher under his own name. Meanwhile, the same material that Chevalier ripped off provides the inspiration for a movie that Benjamin’s two new friends, Tabatha (Halley Feiffer) and Lonnie (Héctor Jiménez), want to produce on their pitiable camcorder. When Lonnie steers his story in a new direction, however, Benjamin fears the worst and starts to think that the source material is being bastardized. Given all of the colorful edits Chevalier came up with, Benjamin doesn’t know the half of it. The funny thing about this movie is that even though it works with lots of details from the sci-fi genre, it acknowledges how dull life on Earth can be. It manages to use that to its advantage, though: The setting and story merely provide a canvas for the lively characters to be painted onto, and the cast provides the material with enough energy to make it silly from start to finish. As a matter of fact, this movie looks like something a teenager came up with. That was a compliment. David, I think you did a fine job on this review. After reading fifty reviews with such completely polarizing views, I have to think that Jared Hess is going to be a contender in the race for king of the nerds title. I have a vested interest in the film, in that my art is used for two of the covers shown in the opening credits. Does that make my art bad, and subject to ridicule through association? I don’t care, and neither does Jared Hess. I have yet to see the film, because I don’t live in a city where it is playing, but I will go to Dallas when it opens there next week and see it with my adult daughter in a theater. I appreciate your comments, and ignore the naysayers. David, I think it’s awesome that your work was used in this movie! I loved that part of the movie. It was so pitch-perfect. Great job! I really enjoyed the movie, partially because I read tons of weird Sci-Fi novels as a kid and I always loved looking at the covers.